Was it finally winter finally? By the time I got outside, the scant millimeter of snow that we got had melted and the skies were clear. And it was warming up again. I think that the season has been toying with me, bringing week after week of warm spring-like days alternating with gusty arctic ones. For someone who likes matching my meals to the season, this has all made for some pretty schizophrenic eating. I have found myself wanting to nibble on mâche and radishes, and then wanting to bury myself under cheese and carbs the next day. As it is currently quite chilly, I feel like I need to hurry up and cook some cold-weather food before the temps climb back up to 60°. This cauliflower gratin fits the bill quite well. It is basically a macaroni and cheese, with the cauliflower filling in for the mac — which makes it feel somewhat healthier! 1. Preheat the over to 350°. Rub a large ceramic or clay baking dish with the smashed clove of garlic. 2. Combine the cauliflower florets with the ham in a large bowl. 3. In a medium-sized sauce pan, melt the 4 tablespoons of butter over medium-low heat. Once the butter has melted, stir in the flour. Cook the flour for about a two or three minutes (you want to get rid of that raw, floury taste). Once the flour has toasted a little, add the milk all at once and whisk everything together. Add the nutmeg. Raise the heat to medium, and continue to whisk the sauce as it thickens. Once the sauce has thickened, turn off the heat and stir in the cheese. Continue stirring until all the cheese has melted. Adjust the seasoning. 4. Pour the sauce over the cauliflower and the ham. Stir everything together until the cauliflower is evenly coated. Tip everything into the baking dish. 5. Melt the remaining tablespoon of butter. Toss the breadcrumbs in the melted butter, and then spread them evenly over the top of the cauliflower. 6. Bake for about 40 minutes, or until the gratin top is browned. The sides should be nice and bubbly too. Let rest for about ten minutes before serving. Oh baby, ham is my favourite. Your version looks delicious. I don’t know why I’ve never added ham to cauli. Though I think I have used bacon before. I like any excuse to eat cauli and was craving a cheesey cauli dish last week, but since they aren’t in season here in NZ, they are are ridiculous $5 each. Broccoli was only $1 each so I made do with broccoli instead. That teaches me for craving out of season foods! I too love any excuse to make vegetables even better by adding cheese! Wow, comparatively speaking, that is a big difference in price between broccoli and cauliflower. Sigh. Stupid globalization that makes it possible to crave and have anything you want whenever you want as long as you pay for it! Well, we’re not ham eaters but I don’t see why we can’t make this vegetarian? I have a lot of Cauli left over tonight. It can definitely be made vegetarian. I should have included that in the recipe. Cauliflower gratin is a great thing to make if you have a lot of leftover cauliflower! Me too! Have you ever made your own sourdough bread? That’s up on my list of things to do this year. I got this amazing sourdough rye from Bakeri in Williamsburg. Have you been? I couldn’t finish the loaf, so I froze it. When I decided to make this gratin, I remembered that I had it and decided to use it! Great recipe – i can do it for me and then remove the ham for the veggie Mrs! This looks great and cauliflower is always a favorite this season. I’ll definitely try your recipe. I love cauliflower which my husband just boils whole and later topped with creamy cheese sauce. Oooh! The way your husband makes cauliflower sounds wonderful and easy to make! Yummy! 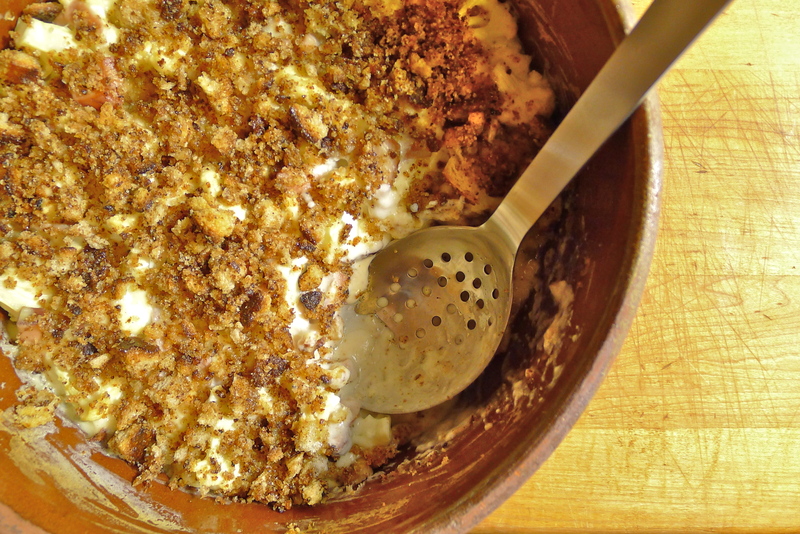 Sourdough rye breadcrumbs sound sooooooo tasty! I bet they add a nice little “zip” to the recipe. I bet Hubby would eat this dish even though it has cauli in it. If I told him it was a “ham, bread, and cheese dish” he would gobble it right down and not even notice the vegetable. Haha! Yes, you can be even sneakier: as cauliflower is white (a decidedly unvegetable-looking color), you can also say that those white blobs are just some kind of high-protein cheese that didn’t melt! this looks so absolutely lovely!!! MMmmmm!!!! !